Garnier Micellar Cleansing Water is a simple way to cleanse, remove makeup, hydrate and soothe the skin. It contains micelles which act like magnets on the skin to draw out impurities and traces of makeup without having to rinse or rub the skin. It works on eye makeup and lip makeup too. It is fragrance free and hypoallergenic. It comes packaged in a large, clear bottle that holds 400ml of product and it claims to be enough for 200 uses (when using 2ml per use). The bottle has a pink, flip cap lid and the product information is on a clear sticker that is stuck on the front of the bottle and a white sticker on the back. To use, you need to apply some Micellar Water to a cotton wool pad/ball and gently sweep across the face until makeup is removed. Alternatively, you can use it just as a cleanser on a makeup-free face, if you prefer. 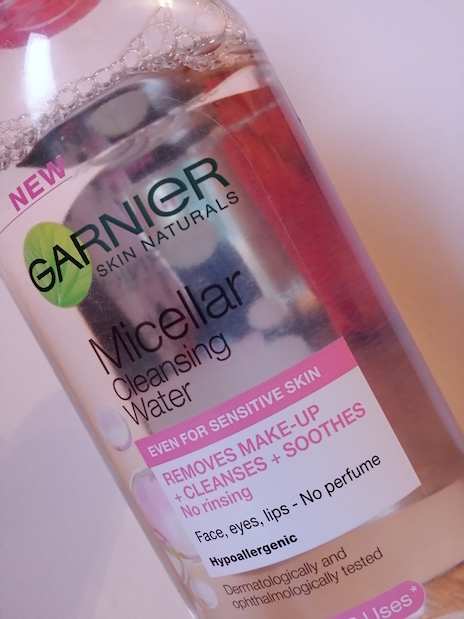 The Garnier Micellar Cleansing Water removes makeup easily, including eye and lip makeup, without irritation. However, I did find that I need to go through a few cotton pads to thoroughly remove all traces of makeup rather than just a couple. A slight issue that I did come across was that the skin was left a little dry. Whilst it was dryer than after using the Taaj Himalaya Micellar Water (which admittedly is the only other micellar water that I have tried and therefore can compare it to), it wasn't an uncomfortable dry or the type of dry that would cause concern. One thing that it won't do a great job with it waterproof eye makeup. The Micellar Cleansing Water is not oil-based and to remove waterproof makeup you'd be better placed in the hands of an oil-based makeup remover. Putting the issues aside though, this Micellar Water does a great job at removing all traces of makeup, even if it does take an extra cotton pad or so to achieve it. The face is left feeling incredibly clean which some makeup removers fail to do, and in the end that is really the most important part. I also think that it is a good product for those with sensitive skin as it doesn’t cause irritation and it is fragrance free. Overall, the Garnier Micellar Cleansing Water is a pretty good product. In my honest opinion I do prefer the Taaj Himalaya Micellar Water as I feel that it does a better job at removing makeup more quickly and the skin isn't left feeling dry afterward. For the price though the Garnier Micellar Cleansing Water is a solid and affordable product that will do what it says on the bottle. Along with this, it is easily accessible, being available on the high street rather than just online in exclusive places. You can purchase a 400ml bottle of Garnier Micellar Cleansing Water for £4.99 from Boots or Superdrug. At the time of posting, Boots currently have 1/3rd of Garnier skincare and are currently selling it for only £3.33! 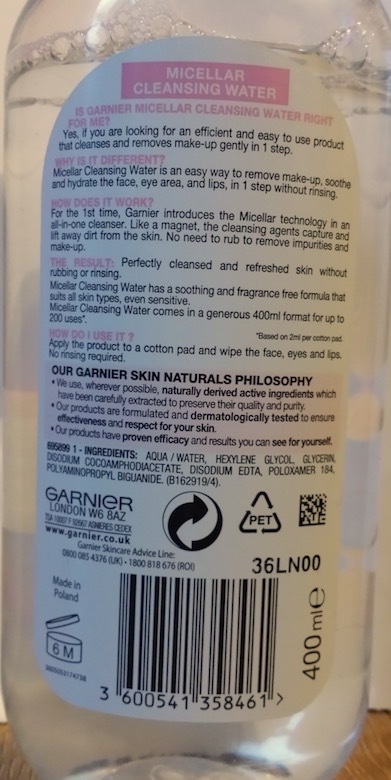 What are your thoughts on the Garnier Micellar Cleansing Water? Is there another micellar water that you prefer?